Englund Gambit - Chess Gambits- Harking back to the 19th century! The Englund Gambit is Black's only way of getting a central gambit on the board by force after 1.d4, whereupon Black plays 1...e5. The Englund Gambit is easily underestimated, and often leads to highly unusual positions, and tends to score quite well for Black in practice. The bad news for Black is that it is objectively somewhat dubious, for unlike the Albin Counter-Gambit (1.d4 d5 2.c4 e5), White has not weakened the b4 and d4-squares with c2-c4, and Black does not get a powerful pawn on d4. 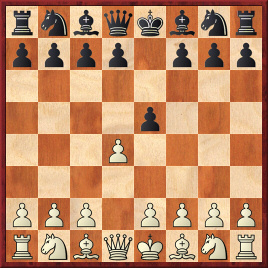 Thus, the Englund Gambit may provide fans of unorthodox openings with a lot of fun, but is hard to recommend for players striving mainly for improvement. I give quite a comprehensive coverage of the Englund Gambit complex so that readers can decide for themselves if the potential rewards are worth the risks. The line 1.d4 e5 2.dxe5 Nc6 3.Nf3 Qe7 was first established by Karlos Betins, who also established the Latvian Gambit (1.e4 e5 2.Nf3 f5), but Fritz Englund got the gambit named after him due to having arranged a thematic tournament in which every game had to begin with Betins's main line, 4.Qd5. Following 1.d4 e5 2.dxe5, Black can either try to blast open the centre immediately with a quick ...d6 or ...f6, or round up the e5-pawn with ...Qe7 or ...Ne7.